TIFF 2011 comes to a close with a sit down brunch at the Four Seasons. Oh, and awards. Piers Handling and the Canadian jury with Cameron Bailey (centre). Turns out rushing to the TIFF awards brunch is about as pressing as zipping off to The Story of Film—it’s long, you’ll catch most of it. Besides elbowing for a mimosa and fresh pastries, the urgency of the awards starting took a back seat to ensuring everyone was sufficiently caffeinated to be glued to their phones, taking the occasional break to chomp into a rather delicate portion of quiche. As debates over films finally turned to dissent over the lack of bacon on the menu, the lights went down and the ceremony began. 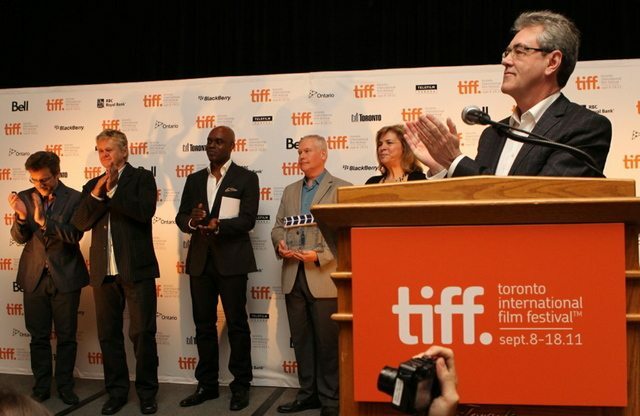 After the requisite montage of 2011 highlights (including the requisite glowing praise for TIFF from everyone from Bono to George Clooney, but not Uncle Marv), Cameron Bailey got things going quickly, inviting the Canadian jury on stage to announce the batch of Canuck winners for 2011. First off, Doubles With Slight Pepper took home Best Canadian Short, with honourable mentions going to Mathieu Tremblay’s Of events (D’aléas) and Ryan Flowers and Lisa Pham’s No Words Came Down. (While the runners-up are awarded no money, one juror did note that this nod does include “endless high fives.”) Best Canadian First Feature went to Edwin Boyd, which got a strong round of applause for writer/director Nathan Morlando and several audible sighs that Scott Speedman wasn’t in attendance. Watch your back, Gosling. Nathan Morlando accepts his award for Best Canadian First Feature, Edwin Boyd. In an unanimous vote the jury awarded Best Canadian Feature to Philippe Falardeau’s Monsieur Lazhar. A TIFF favourite and producer of Incendies, Falardeau noted how much it mean to him having been a part of the festival for so many years. Winner of the Piazza Grande audience prize at Locarno earlier this year, the TIFF award is fitting recognition for Falardeau from his home country. Next up, The Prize of the International Critics (FIPRESCI Prize) for the Discovery programme went to Axel Petersén’s Avalon. 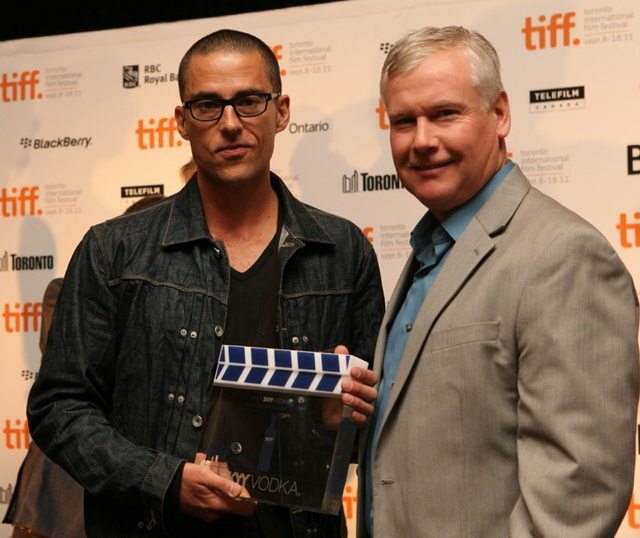 When asked about the unanimous vote, jury member and Torontoist contributor John Semley commented: “Darkly funny and tragic, Axel Petersén’s feature-length debut simply proved the section’s most compelling, sure-footed, film.” The award for Special Presentations went to Gianni Amelio’s The First Man. Bailey took to the stage again for the final award—you know, the one the people vote for, supported by the car that the People would never drive: the Cadillac People’s Choice Award. But not before graciously asking for a round of applause for all the TIFF programmers: hear hear, we say! Midnight Madness (the festival within the festival) gets its own choice award, this year going to The Raid, Gareth Evans’s kung-fu high-flying spectacle. The people (you!) chose Jon Shenk for The Island President for Best Documentary and last, but certainly not least, Where Do We Go Now? by Nadine Labaki took home the big ol’ statue. So there we have it! Awards have been shelled out, all the crème brûlée consumed, and out-of-towners already flocked to the airports to head on home. With another TIFF under its belt, Toronto can roll up those red carpets and send ’em off to the cleaners to keep them fresh for next year. Since, like Arnie, TIFF’ll be back. 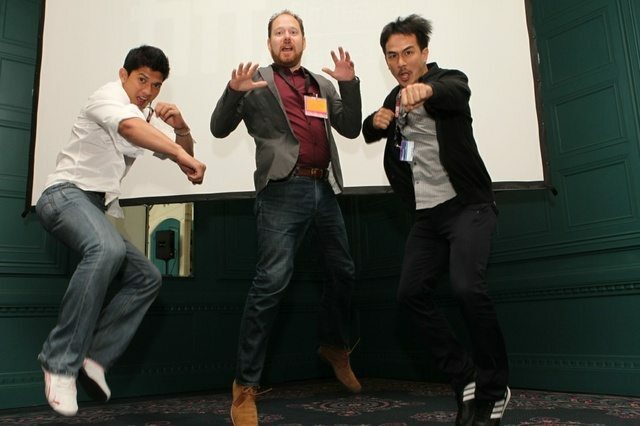 Midnight Madness programmer Colin Geddes (centre) does his token jump with The Raid cast members. CORRECTION: September 19, 2011, 12:05 P.M. This article originally stated that Edwin Boyd won Best Canadian Feature, when in fact it won Best Canadian First Feature. We regret the error.